I received a wonderful comment on this blog from Steven Hassan this morning. I am new to your blog but just wish to say that making the effort to learn about social psychology, hypnosis (like NLP), and cult patterns, narcissists, psychopaths, is so important for folks to understand the experience and heal. Ultimately, going forward as a spiritual being, always listening to your inner voice, seeking out alternative information- especially when there are grandiose claims, like speaking with critics and ex-members, is wise. In other words, having a toolbox that includes not only critical thinking but also reality-testing strategies is vital. In addition, studying other cults- like Scientology, multi-level marketing groups, Tony Robbins and others who in my opinion misuse Milton Erickson's genius. Thank you for being willing to stand up and speak out in the New York Times! You are courageous as is your wife, Sarah and others. I support your efforts! 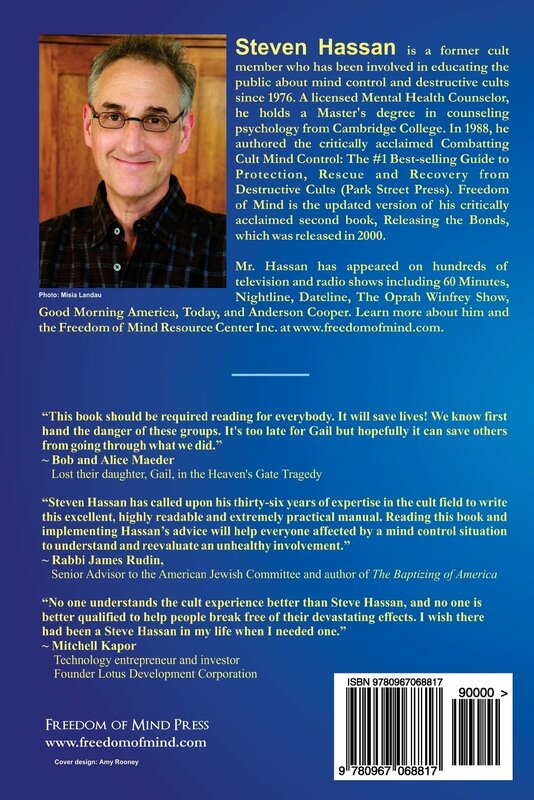 Steven Hassan wrote a magnificent book which has become a resource for a great many people. I highly recomend you read it as soon as possible. It helps people understand what happens inside High Demand Groups and also gives valuable advice for family and friends to help those on the 'inside'. "Steven Hassan's approach is one that I value more than that of any other researcher or clinical practitioner. Hassan is a model of clear exposition, his original ideas are brilliantly presented in a captivating style. I am confident that readers of his new book will share my enthusiasm for what this author tells us about how to deal with the growing menace of undue social influence and cults." Philip G. Zambardo, Ph.D. President of the American Psychological Association (2002). Professor Emertus of Psychology, Stanford University, President and Founder of the Heroic Imagination Project. Philip George Zimbardo (born March 23, 1933) is a psychologist and a professor emeritus at Stanford University. He became known for his 1971 Stanford prison experiment and has since authored various introductory psychology books, textbooks for college students, and other notable works, including The Lucifer Effect, The Time Paradox and The Time Cure. He is also the founder and president of the Heroic Imagination Project. The resource list so far.